NOTE: The following is a translation of True Mother’s Hoon Dok Hwe at Kona King Garden on January, 18, 2014. This is an unofficial translation and should not be considered authoritative or quoted in any publication without prior permission from FFWPU USA. On January, 18, 2014, True Mother was greeted upon her arrival in Hawaii by local members with a greeting of "Aloha" (Welcome) and her response of "Mahalo!" (Thank you). After receiving a presentation of flowers and cutting of the celebration cake, True Mother began to speak. Whenever True Parents come to Kona, it's for a special providential purpose, making a foundation for an important upcoming event. The Spirit World prepares the way as we go. When I landed in Honolulu this morning at 4:30 AM, Unificationists were there to greet me. One wife reported that my late son, Hyo Jin Moon, had appeared in her dream the night before, telling her that he will be accompanying me to protect and serve me on this trip. We don't see it with our physical eyes, but the Spirit World knows True Parents' schedule and is always making preparations and conditions to support our providential activities. 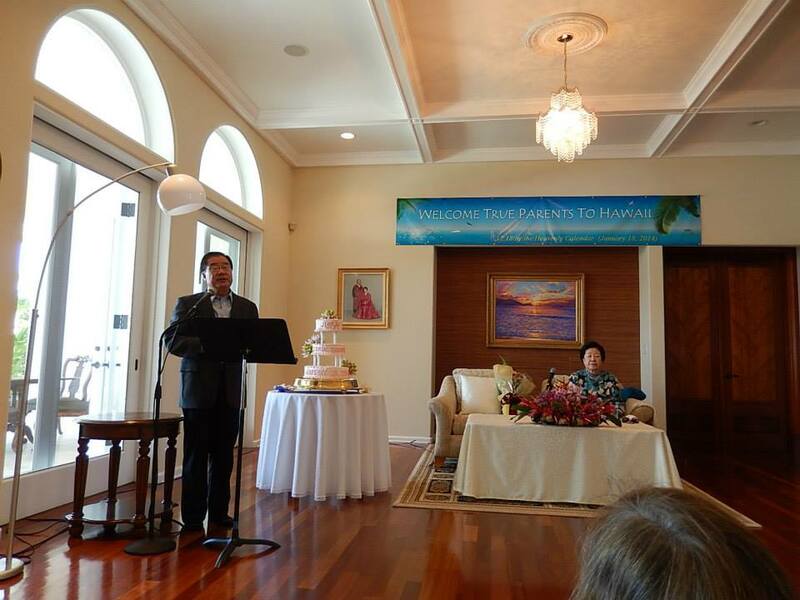 Before True Parents completed special providential events, we prepared in Kona, offering prayer and other conditions. For example, we came to Kona before we went to meet Gorbachev and Kim Il Sung, and last summer I came to make preparations for the first anniversary of True Father's Seonghwa (Ascension). Now, I am in the midst of a 21-day condition before the first anniversary of Foundation Day. As you know, I have been educating second-generation future leaders at the Universal Peace Academy. Twenty UPA students are now touring America, meeting Unificationist youth and finding out about activities of the Unification Movement here. They started in New York and are visiting all the major cities to promote UPA and to share their testimonies, and hear testimonies of True Parents' heart and work in America. They are amazed to see True Parents' worldwide foundation and were deeply impressed by the East Garden Holy Ground in New York. They shed tears as they heard testimonies from Unificationists of the staff working there. They felt True Parents' tears for America and the world and are inheriting the spirit that was invested here during the past forty years. Think about Kona: how many times have True Parents come here, always making conditions for the sake of God's special providential events? After East Garden, Kona is the most precious place because True Parents have come here for the sake of the worldwide providence. The UPA students would have similar tearful experiences when hearing testimonies from Kona. Why am I sharing this? It is because you have a tremendous spiritual background and foundation. You have a worldwide mission, a critical responsibility to testify to True Parents, to extend and multiply our church foundation, and to multiply Blessed Central Families. You have that position and responsibility, and you need to move forward with the same heart as True Parents. Please study hard and work hard. You have heard about the International Education Center in Las Vegas. For four years, True Parents worked there to make Las Vegas a central city for worldwide education through True Parents' teachings. The Education Center is half done, and should be completed before the end of this summer. It will be an international education center. In the lobby, there will be a museum displaying the activities of True Parents and the Unification Movement in America. A Hawaiian Queen Coffee Shop should also be there. Il Hwa and Hawaii Queen Coffee have combined their efforts and are working together to extend their foundation in all directions: north, south, east and west. I truly hope that Hawaiian Queen Coffee becomes the most popular coffee in Korea. As you know, it won the Crown Cupping Competition last November during the Kona Coffee Cultural Festival. The International Education Center in Las Vegas will have fifty hotel sleeping rooms, a convention hall that seats 1,000 people, and nine conference rooms. I recently had a meeting with the contractors and designers. They presented their ideas and plans and expected me to give my suggestions. Instead, I explained that they first needed to understand the Founder and the vision. I then taught them Divine Principle for over one hour and gave each of them a DVD of my main speech in Korea last year. One interior designer, who had brought a selection of colors and themes for me to choose from, was very inspired. She has a Catholic background and is married and a mother of two children, aged five and ten. She had read True Father's autobiography and was deeply impressed. She read it right away and came back asking to study Divine Principle. Through Rev. Jenkins' lectures, she found that her questions, such as why God could not stop the Fall, were answered. Now she and her husband are preparing to attend the Foundation Day Blessing. She is my spiritual daughter who I taught the Mission of Jesus and the Mission of True Parents during a business meeting! Likewise, each of you should witness in the same way, without excuse, no matter how busy you are. Today, my greatest concern is witnessing. That's the first and most important point that I make everywhere I speak. Think about the Oakland Church in the San Francisco Bay area. Most American members joined there during the course of their travels. This is the American church history. Hawaii is the most attractive place in America, so you should study the Oakland model and discover how to apply it here. I have directed Bishop Kim to analyze this and focus on implementing it in Kona and Honolulu. The two should work together in their outreach efforts. Visitors to Hawaii should meet our members, be introduced to True Parents and take that experience home with them. Let’s share our happiness with others. Please inherit my message heartistically and practice these words. There needs to be unity between True Parents and all Blessed Central Families. We are capable people and can do anything centering on True Parents. Let’s be alive and active, sharing the happiness that we have received as Blessed Central Families together with True Parents. Share that happiness with your neighbors, tribes and communities. Let's recite this year's motto: "Let us become true owners of Cheon Il Guk (God’s Heavenly Kingdom) who practice true love in resemblance to our Creator, the Heavenly Parent!" This is the motto until 2020. Let us unite with and memorize it. The Divine Principle teaches that God is the Creator who created everything in preparation for the Ideal world and the ideal family. It is our responsibility to extend God's ideal. I held a major rally for the Northeast Asia Peace Initiative in Korea at the end of last year and gave an important message to China, Japan, Korea and America in this regard. I prepared a special video for you about this event, to be shown at Sunday Service tomorrow. These days, information flies from home to home and from one family member to another. This is the age of fast communication. However, I was surprised to find that you don't seem to know about True Mother's work in Korea. Without understanding True Parents well, how can you testify in the spirit world about what you did with True Parents while on Earth? You need to make total harmony between your spirit and body and unite with True Parents. There is such beautiful nature here in Hawaii. You should keep a busy schedule every day and night to witness. Witnessing creates the happiest moments where you can see resurrected life and hope. But, if you have no passion, you won’t want to witness. As much as possible, speak about True Parents. They are not simply our term or idea. Instead, God envisioned and desired to establish True Parents as the ancestors of humankind even before the creation. They are now here in substance, so we must spread the word!